Buddhist sculpture fragments, nails and and hinges, from Rhode Tope, Sanghao, Peshawar District. bl.uk > Online Gallery Home	> Online exhibitions	> Asia, Pacific and Africa Collections	> Buddhist sculpture fragments, nails and and hinges, from Rhode Tope, Sanghao, Peshawar District. Photograph of Buddhist sculpture fragments, nails and and hinges, from Rhode Tope in Sanghao, Peshawar District from the Archaeological Survey of India Collections: Indian Museum Series (Duplicates), taken by Henry Hardy Cole in c. 1833. 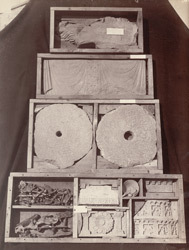 These sculpture fragments and other artefacts are shown boxed for transportation.